Forced-air bakery appliance specially designed to take bakery trays. Adjustable L-shaped trayslides suitable for 600 x 400 mm bakery trays. Forced-air system guarantees a constant temperature of between +2°C and +15°C. 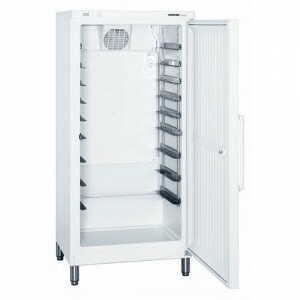 Our forced-air bakery appliances are specially designed to take bakery trays. The adjustable L-shaped trayslides are suitable for 600 x 400 mm bakery trays. The forced-air system guarantees a constant temperature of between +2°C and +15°C throughout the interior. The powerful forced-air system ensures that product is chilled quickly and that the temperature remains even throughout the interior. In the BKv 4000 model, a maximum of 22 pairs of trayslides for 600 x 400 mm trays can be fitted. Trays are not included with the appliance.